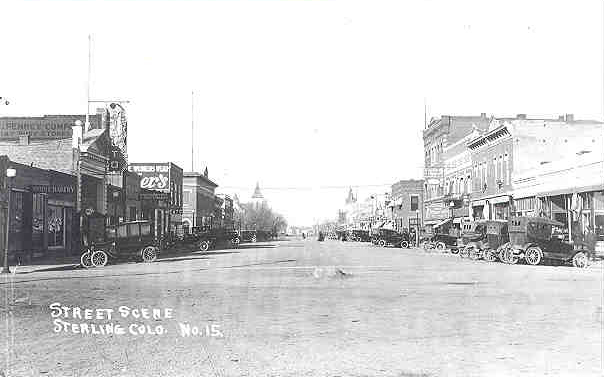 Photograph of Main Street in Sterling Colorado facing north taken in the 1920s. At their regular meeting Tuesday, the Sterling City Council approved a resolution asking voters to take out a loan of up to $37 million to replace aging infrastructure and address “inflow and infiltration” issues. The interest rate on the bond would not exceed 3.25 percent. Repaying the wastewater bond will require city sewer rates to go up, but how much has not been identified. The council has been awaiting the results of a rate study for water and sewer services that looked at infrastructure needs, debt service and operational costs, but an evaluation of the wastewater treatment system done in 2016 by engineering firm Mott MacDonald suggested they go up $23. Since then, the city has implemented flat rate hikes annually, in anticipation of higher rates to pay for the required system upgrades. The ballot question specifies infrastructure improvements that include changes to the headworks building, which suffered extensive flood damage in 2013; replacing the existing force main and constructing a redundancy in case of failures; modifications to the main plant; lift station replacements and corrective measures for the collection system. One of the problems the system has is leaks from the storm sewer system that can flood the wastewater lines and disrupt the treatment process after heavy rain events. Failure to make the improvements could result in hefty fines from the Colorado Department of Public Health and Environment, as much as $10,000 from the date of the first violation in November 2017. Several Bureau of Reclamation reservoirs in New Mexico will end this summer with minimal pools of water, after having done exactly what they are intended to do – provide water stored during wet times for use in dry periods. Through most of this summer, the reservoirs have released water for farmers, municipalities, industrial use, and recreation. Due to water stored in previous years, farmers along the Rio Grande received irrigation water, municipalities received water and hundreds of thousands of people enjoyed recreational benefits in New Mexico in spite of a hot, dry summer that followed one of the driest winters on record. 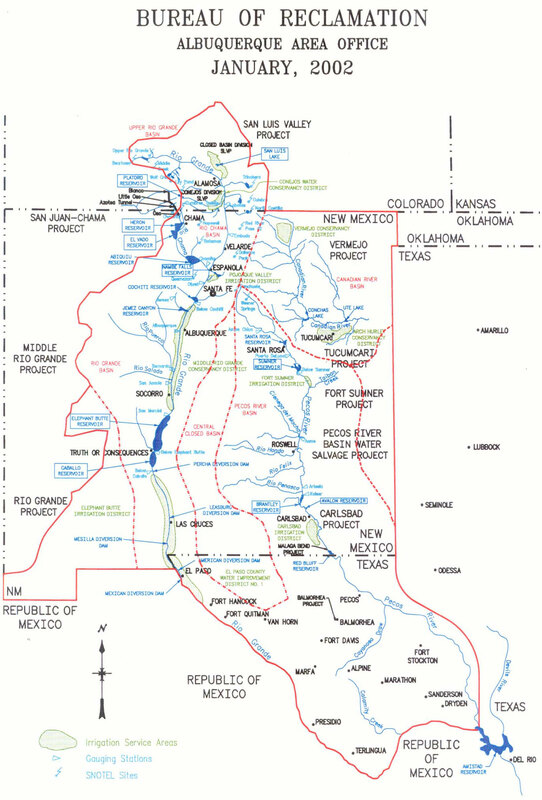 Heron Reservoir in northern New Mexico stores water as part of the San Juan-Chama Project for various municipal and agricultural uses including the Albuquerque Bernalillo County Water Utility Authority and Middle Rio Grande Conservancy District. Heron is currently holding approximately 101,000 acre-feet of water, which is 25 percent of its capacity. That quantity will decrease steadily through the end of the year as San Juan-Chama Project contractors use their supplies or move them downstream. El Vado Reservoir reached a low point of about 5 percent of capacity at 9,344 acre-feet earlier this summer before the Middle Rio Grande Conservancy District ran out of storage in the reservoir. El Vado is currently holding only San Juan-Chama Project water, and should remain relatively steady until next spring. Elephant Butte Reservoir is expected to reach a low of about 49,000 acre-feet at the end of September when irrigation releases for the Rio Grande Project and deliveries to the Republic of Mexico conclude. That content would be the lowest in Elephant Butte since 1971. This would be less than 3 percent of the reservoir’s capacity. The reservoir is then expected to start gaining storage through the winter. Caballo Reservoir is expected to end the season with about 25,600 acre-feet of water, which is 11 percent of its capacity. Water levels at these reservoirs are on track with Reclamation forecasts presented this spring, when Reclamation shared expectations for a year with one of the lowest snowpacks and spring runoffs on record.